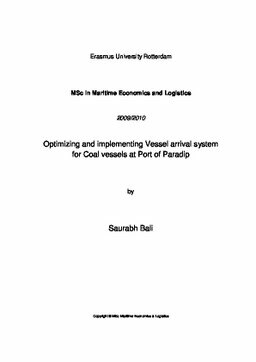 The objective of this paper is to implement a Vessel arrival system for a major Indian port “Paradip” for minimizing waiting time of Coal vessels and reduce vessel operation and demurrage costs. As a result this will improve supply chain efficiency of coal transport. This study is carried out due to recent huge congestions observed at Port of Paradip due to surge in coal demand particularly for Power sector in India and due to lack of adequate handling facilities & productivity of ports in India. Moreover congestion in port attributes to fleet of vessels being held in port which means less utilization of vessels and as a result loss of earnings & demurrage costs. The method applied here requires adjustment of vessel’s speed to most economical speed for a targeted ETA in agreement with all concerned parties, matched with a berthing time of the vessel so as to minimize waiting period at anchorage prior berthing and cargo operations. While proceeding at slow speeds vessel save a lot in terms of fuel consumption and demurrage costs incurred. The factors which influence the decision of adjusting speed have been taken as independent variable with respect to speed and a multiple regression model is developed to see positive correlation of these factors with speed. For evaluation of cost saved another model under optimization process gives a function of speed. Results of cost savings is shown with economical speeds applied on actual case scenarios of vessels called at Paradip port. Apart from this analysis other inefficiencies and causes of demurrage costs incurred in supply chain have been discussed with possible solutions. However these solutions have been noted to be of long term planning and execution hence Vessel arrival system can be contributed as an only immediate solution to reduce waiting times and resulting cost savings which improve efficiency as well as profitability of supply chain of coal transport in Indian port of Paradip.